This entry was posted in Bloggers, Sartorial by Sir Edward Percival Fox-Ingleby, Bt. Bookmark the permalink. 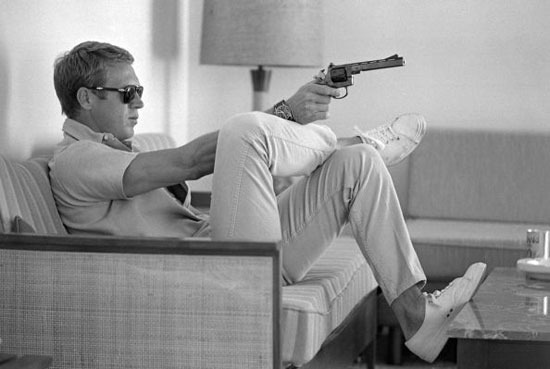 Ahh, McQueen with a pair of Persols, a cool wristwatch (probably a Rolex Explorer or Submariner, maybe. Actually, no. It looks like a chronograph, so I’m betting something like a Heuer or Hanhart), and a pistol. He knew how to deal with crap. And please note the Jack Purcells he’s sporting…Yes, he knew how to deal…. Nice write up. i like hermosa beach marketing manhattan beach seo and manhattan beach marketing. You’ve made my day! Thx again.